Mocorunning's preseason individual favorites, Ryan Lockett of Poolesville High School and Abigail Green of Walter Johnson High School, returned to the spotlight with notable performances at the DCXC Invitational in Kennilworth Park in Washington DC on Saturday. Green was the top Montgomery County female performer with a second place time of 17:54. Lockett was the top Montgomery County male performer with a third place time of 15:39. Technically, Green made her season debut earlier in the week when she ran away from teammates on her home course with a time of 18:41.28, but Saturday at DCXC was a challenge of a higher caliber. 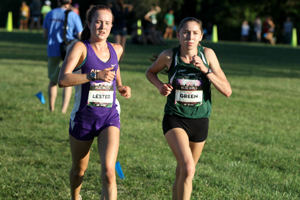 Green found fellow Footlocker qualifier, Page Lester of National Cathedral School, early in the race and the two distanced themselves from the field immediately. Green says that Lester began to pull away at about the two mile marker. Lester went on to win by 20 seconds in 17:34. Said Green, "I don't have any base training under me. I just have really scattered training so I feel like that might have gotten to me a little bit, but at the same time I just really wanted to come out here and see where I was at." 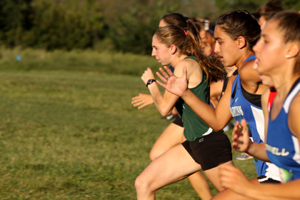 She qualified for and raced in elite track races over the summer which is why she felt like she did not have a proper base for cross country season. Additionally, she struggled with illness throughout the summer and delayed her first major race until this first weekend of fall. She continued: "I'm really happy to be back. You don't realize how much you love racing until you can't do it. I'm really happy that we have such a good team and I'm really, really happy that I can be here hopefully for states to help the team win again." Demonstrating outstanding depth across all four grade levels, Walter Johnson claimed the overall DCXC girls team title. 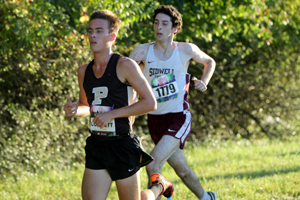 Poolesville's Ryan Lockett ran four races prior to the DCXC Invitational and most of those outcomes left fans wondering if he would be the same Ryan Lockett as he was last school year. He explained that he trained through two dual meets and that he was not feeling great at the Brunswick and Oatlands Invitationals. Said Lockett, "Bad races are a part of running and they are just as important as your good races. I've learned a lot the past couple races." "Brunswick was different. I fell and it was muddy, but I didn't feel that great that race so I'm not even sure that I would win if I didn't fall. Oatlands: I went out thinking, 'Oh, I'm going to try to test for the win,' and I blew up after the first mile. I've done a lot of volume workouts which will hopefully benefit me at the end of the season." Lockett called Saturday's third place finish at the DCXC Invitational a confidence booster. He said that he was familiar with Grafton's Price Owens and allowed him to take off along with St. Sebastian's Caleb McCurdy. He elected to remain in the chase pack for the first two miles and keyed off a familiar rival: B-CC's Adam Nakasaka. "I just stayed with Adam who I've raced so many times...Everyone pushed me and we ran a decently fast pace. I think the pack really started to spread out at the last mile. It was just me and Adam with a half mile left." He separated from Nakasaka by five seconds over the final half mile and finished third in 15:39. Nakasaka was fourth in 15:44. "I feel really good about it," said Lockett, "Really, it's huge because of my...Oatlands. But I'm really excited. I've been training to peak at the end of the season which I really think I'm going to do. There is a lot more to come from me and I can't wait to show everyone." 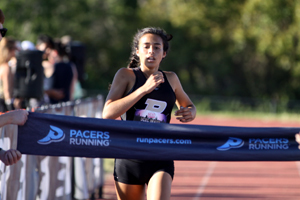 The only race winner of the day from a Montgomery County school was Nandini Satsangi of Poolesville High School who won the varsity girls junior class race in 18:59. Satsangi almost did not complete the final 25 meters as she appeared to be overcome by the heat. She stopped once before the line, regained her form, and then collapsed across the finish tape. She later speculated that dehydration played a role. Prior to the dramatic finish, she ran most of the race with Caroline Howley of McLean High School, who perhaps also struggled with the heat. Satsangi said that she started out slower than she usually runs for the first mile and made a decisive move at about the midway point in the race. Her closest opponent, Howley faded to fourth in 19:24, while Satsangi ran alone for the second half and won in 18:59. On her season so far, Satsangi said, "It's been going better than last season so I'm happy with that. Last season I didn't run any good races until DCXC, so I'm happy that I've been having a good season so far and hopefully I'll be able to hit some faster times later." Moti Heda is someone to watch out for!